Seeing as I’m embarking on the sun protection series, it would be remiss of me not to mention that throughout the month of June, Cover FX will be making donations to Skcin, The Karen Clifford Skin Cancer Charity in the UK. If you’re looking for new Summer skin protection and like the look of their wares… Cover FX will rightly donate more on purchases of Cover FX SkinTint FX (SPF 30) and Cover FX BritePrep FX (SPF 50). 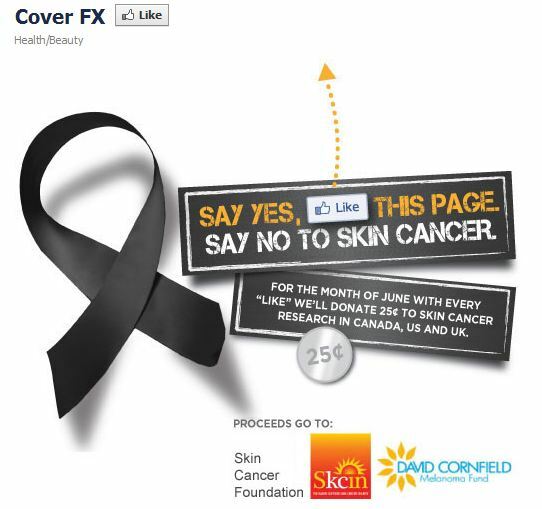 Click “Like” on the Cover FX Facebook Page to ensure a 25¢ donation to skin cancer research. Cover FX products are available from select Harvey Nichols, Harveynichols.com, House Of Fraser and houseoffraser.co.uk. You can follow their efforts via the #saveface hash tag on Twitter. I like it when companies will donate. And even if it is just a little amount it is hardly any bother on our end is it.